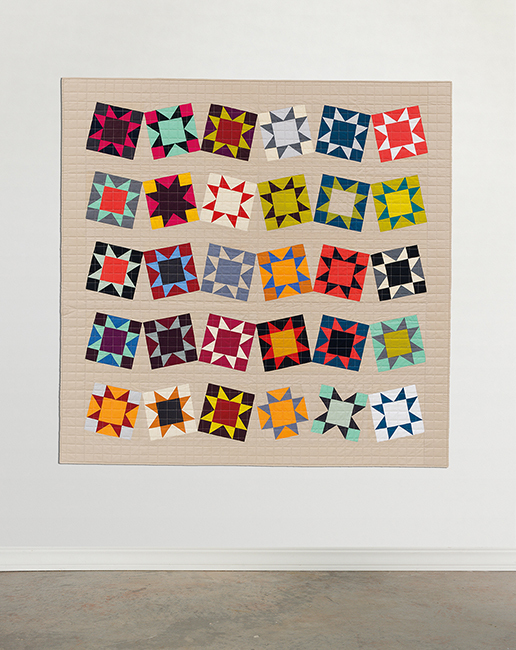 Solids: they're versatile, they're affordable, and they've got the starring role in 13 vibrant quilts by top designers! This new collection of bright and simple-to-stitch designs with subtle modern style shines in colorful Kona Cottons. 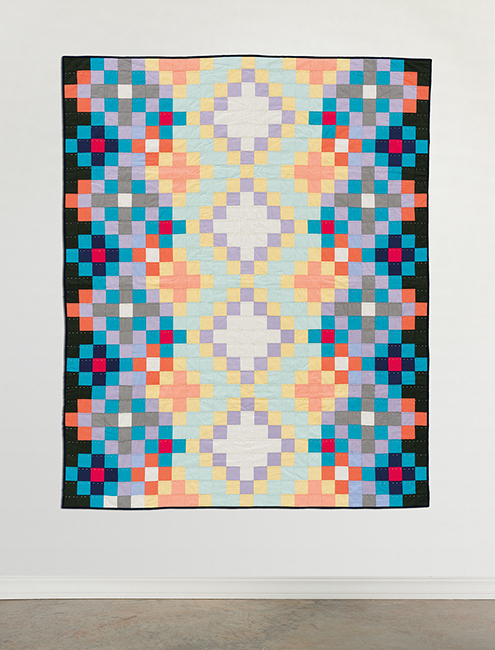 Re-creating each quilt is a snap, thanks to comprehensive color keys and color names included with each pattern. With a Baker’s Dozen of project, all done in solids, you will be busy creating beautiful quilts for many months. The two-page introduction includes seven quilt experts and their view on why solids make such great items. 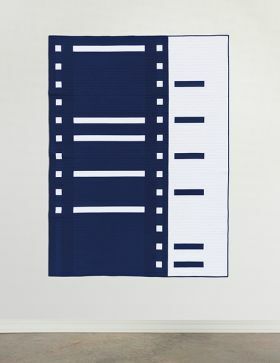 This is followed by a full-page color photo of the quilt, a blurb about it, the finished block and quilt size and, of course, the material and cutting lists. There are enough graphics that will keep you on track. The finishing quilting design is left up to your own creativity. 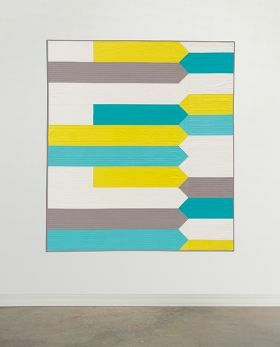 While all the patterns are quilt-sized one, we can always make only one or two rows and have a table runner or shorten the rows and create a table center. 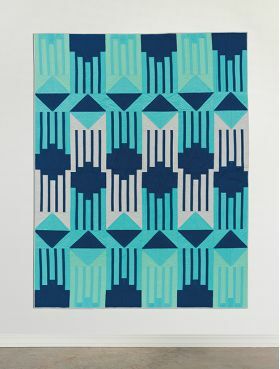 You could even make place mats or mug rugs using these patterns. No matter what you make, they will be beautiful done in solids. 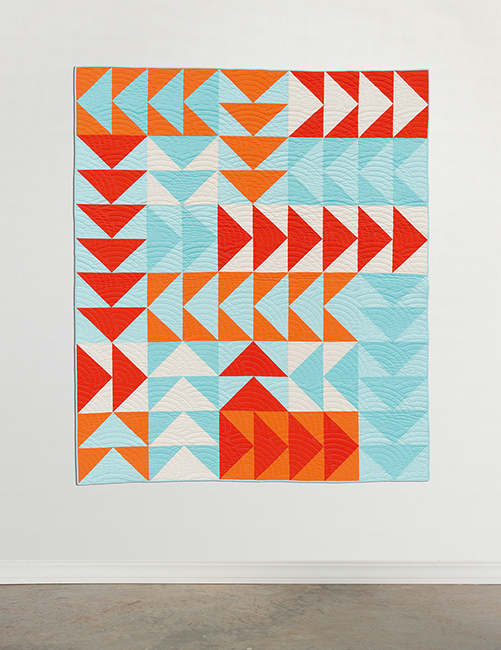 This book is full of fun and playfully modern quilt projects. 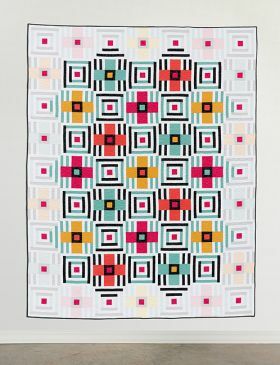 I am a big fan of Kona Cottons and love using them in my quilts. Very user friendly! Well done Karen M. Burns and Julie Herman! Every Quilter and fiber arts specialist needs this book. 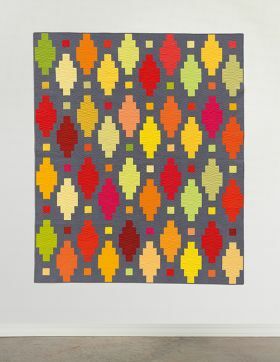 Love the wide range of Kona colors but struggle with how to use them? This is the book for you. 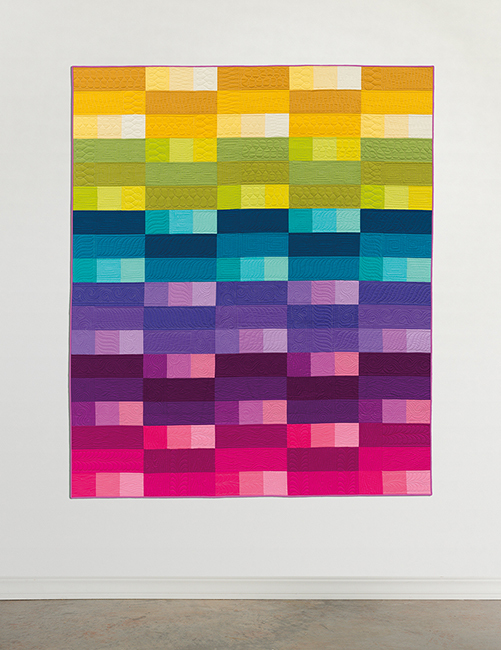 The 13 quilts in Rock Solid range from 2 color quilts to several using more than 30 Kona colors. 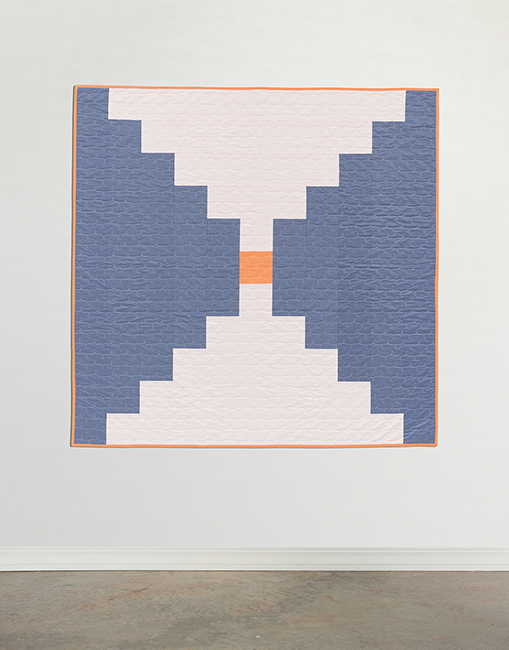 The quilt patterns also range from very simple to more complicated. The patterns are well written and illustrated so quilters of every skill level will find a match. As someone who often struggles with using solids well, I found this book to be an excellent addition to my library. Clear, well written instructions and a detailed list of colors used by each designer make this book a hit. 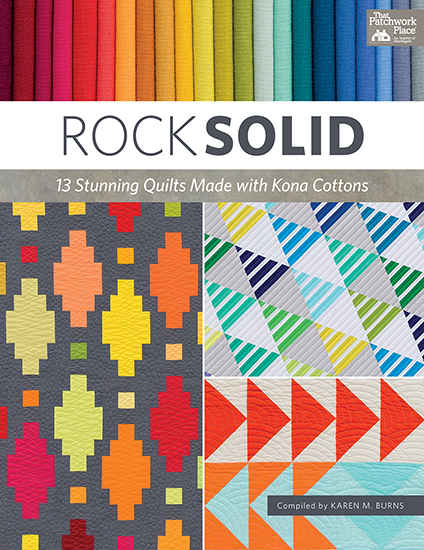 With a variety of patterns from some of the hottest modern quilt designers in the industry, Rock Solid shows the incredible range of Kona Cotton and how powerful solids can be. Love this book! Especially love that all my favorite designers are in this book. And the color chart so I can make the quilts exactly like they are pictured is a bonus for me. When you're short on time and just want to sew it's nice to have the fabric selection already done for me. Patterns are very easy to read and follow. Thank you for the excellent book! Thirty years ago Robert Kaufman Fabrics introduced Kona Cottons. Today there are over 300 colors to choose from! In my 26 years quilting, I have found solid fabrics to be essential to my stash. 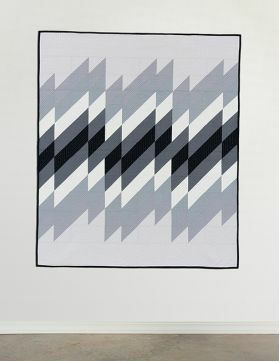 They have become even more essential with the rise of Modern quilting with its minimalist, graphic patterns and use of negative space. 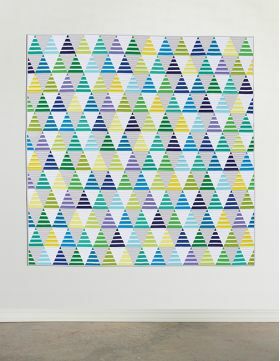 Rock Solid: 13 Quilts Made with Kona Cottons is a visual feast of color, from monotone to analogous to complementary palettes. 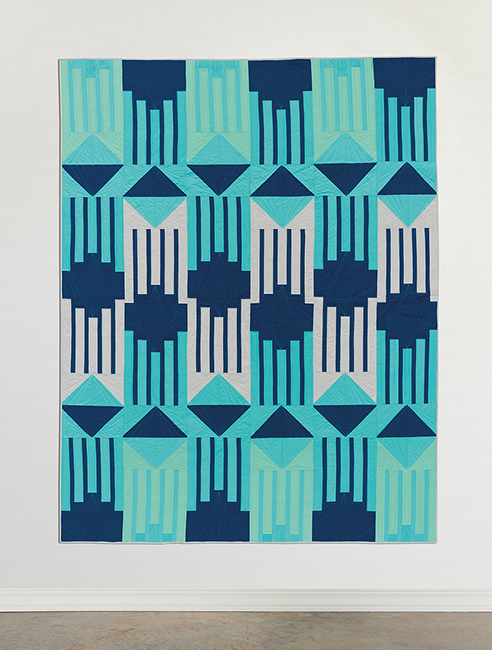 The patterns update traditional blocks to make amazingly simple quilts with the graphic punch of mid-century Modern art. 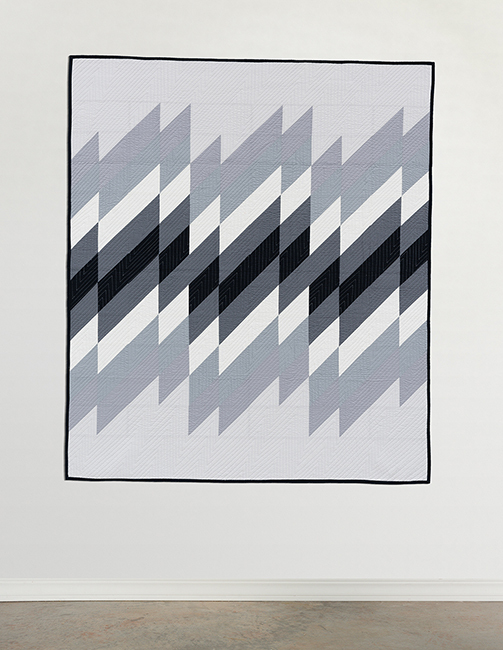 These quilts could be baffling to construct, but the instructions include lots of pictures to illustrate every step. 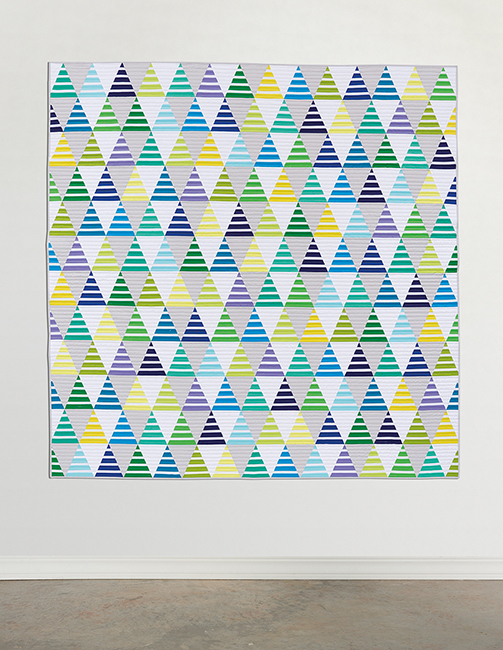 The Color Palettes for each quilt is also included at the end. Rock Solid is a great collection of patterns showcasing solid fabrics. I received a free ebook from the publisher through Edelweiss in exchange for a fair and unbiased review. There's something special about quilts made from solids, and these 13 quilts made with Kona Cottons are no exception. Did you know that Kona Cottons began with a humble 12 colours back in the mid 1980s and the range has grown to a whopping 303 colours, giving quilters endless choice when it comes to solids? 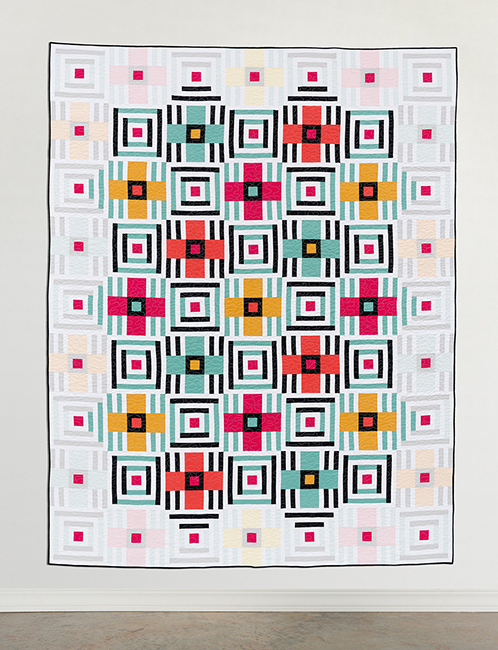 The quilts in this book have a deliciously modern feel, contributors include many well-known names in the modern quilting world, such as Julie Herman, Kristi Schroeder, Christa Watson, Heather Jones, Elizabeth Dackson, Angela Walters and Janice Zeller Ryan. The quilt designs range from simple to complex, and include a range of blocks, shapes and colour schemes--making a great study in colour theory. Some use only two colours, others over 20... the sky's the limit. For convenience, some of the patterns make use of Kona precuts such as Roll Ups and Skinny Strips. Conveniently, while the patterns list the colour names, there's an index in the back of the book with swatches of the colours so you can swap out colours or add prints with ease. 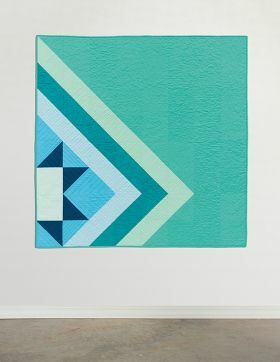 Solid qulits make great gift quilts, because they can easily be customised to any decor--and this book offers a myriad of patterns to inspire! Quilters who love working with solid colours will be familiar with Kona Cottons which have been around for over 20 years. The original 12 primary and bright colours have now been expanded to 303 colours, thus providing a wonderful choice for today's quilters. The experts who made these 13 quilts all explain why they prefer Kona Cottons. 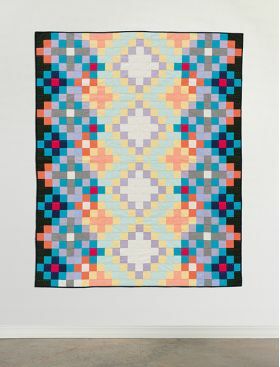 Some of their quilts use only a few colours - others use 20 or more and the styles range from modern to more traditional. The Kona colour names are all given, so that you can make exactly the same quilt if you wish and if you really wonder what colour "frappe" or "mimosa" is, then go to pages 62 and 63. Subtle colour changes are possible with this range of shades. 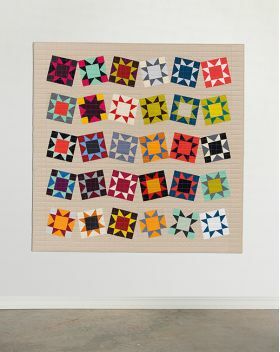 The talented designers who produced these 13 quilts have shown what you can do with plain solids. 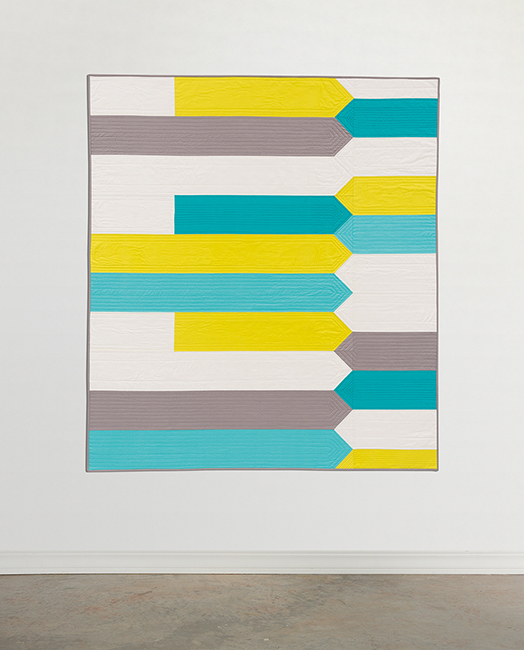 The eye-catching simplicity of "Zoomer" by Elizabeth Dackson and "Columbia" by Debby Grifka are a delight.